Atlantic Offshore has been awarded a four-year contract with the oil- and gas-company Total E&P Norge AS in the North Sea. The company will from 2014 operate a new ERRV, providing for of up to 300 people, in the field of Martin Linge, North West of Stavanger. The agreement is initially for four years and initiates from 2014, with an option another four years. This is the second contract Atlantic Offshore holds with TOTAL in the North Sea – and the first in the Norwegian sector. The ship is designed in collaboration with Havyard, and will be the next generation of emergency vessels with the most modern solutions for fire and emergency preparedness. The ship will also hold nearly 400 square meters loading and storage capacity. Atlantic Offshore has been operating in the Stand-by segment since 1988 and is one of the pioneers in the industry. – we find the contract with TOTAL as a vote of confidence, for both our organisation and for the new design. With the new contract, we are strengthening cooperation with TOTAL, and also our own position in the emergency segment in the North Sea, says CEO Roy Wareberg of Atlantic Offshore. Last week the company signed two contracts with Statoil, which means that the company operates additional two PSV (Platform Supply Vessel) in the North Sea from 2014. 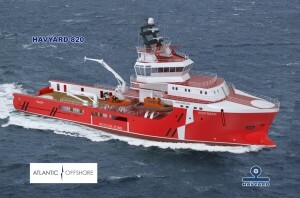 Atlantic Offshore has in recent years worked closely with Havyard regarding the design of the new generation of stand-by vessel, or FSV, which is the industry term (Field Support Vessel). With almost 25 years of experience in emergency response vessels, we have, together with ship designers from Havyard, defined a modern and functional vessel for the future. It meets the requirements both in English and Norwegian sectors. The first vessel will be delivered and goes into operation in 2014. The new building establishes a new standard in our market and we expect more contracts based on this design in a short time. We note that the oil companies have requested emergency vessels are of the highest standard in terms of preparedness, fire safety and oil spill response, and that the vessels also can relieve the platforms by offering cargo or storage capacity, say Wareberg.